This information is subject to change. Please check with the pool staff at the time of your visit for the most up to date information. 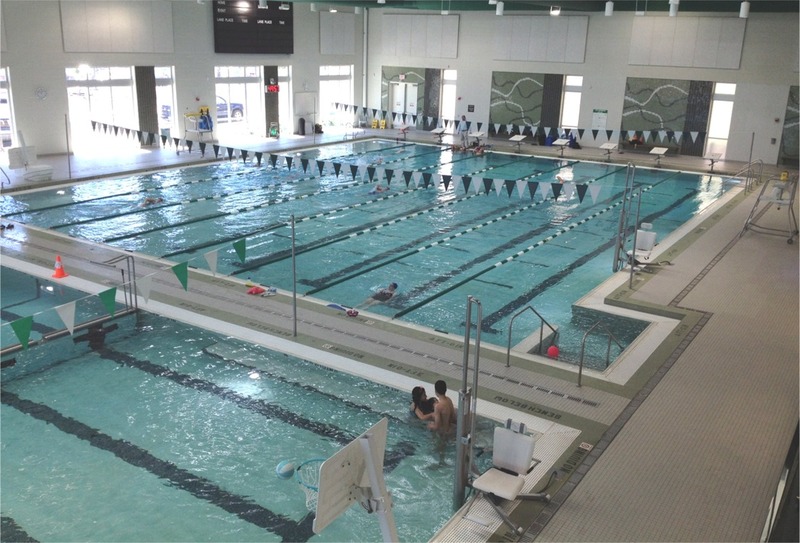 The facility contains two pools, a wet classroom and a large capacity spectator gallery. The main swimming pool is 25 yards by 8 lanes and with a depth of 4 feet to 7 feet in all lanes. This pool is equipped with Colorado Timing System and suited for swimming competition. This pool is kept at 81-83 degrees. The second pool, a combination Diving and Instructional pool is 5 lanes wide and up to 25 meters in length. This pool is 3 feet on one end and 12 on the other and will have a movable wall to separate the shallow (instructional) end of the pool, from the diving well. The wall can be set in several locations to give us different configurations including a 25 yard course. This pool is kept at a 83-85 degrees. Staff is evaluating the needs of the various user groups and working toward developing a schedule of operations that can afford us the best service option to the community. The facility is fully accessible and also offers 4 family changing rooms. The Aquatics Center is located within the School and can be accessed from the new main parking lot.